I got this recipe from my friend Tanya Torline. It looks delish and I don’t want to misplace the recipe so i am sharing it here! Preheat an oven to 350 degrees. Cut bacon strips into thirds; set aside. Cut the stem off each jalapeno then cut in half; remove the seeds. Mix minced garlic and cream cheese together in a small bowl. Spoon the mixture into the jalapeno pepper halves, filling each about 3/4 full. Insert a whole shrimp into each cream cheese-filled jalapeno. Wrap each stuffed pepper with a slice of bacon, securing with a toothpick. Bake until the bacon is browned and crisp, 25 to 30 minutes. 2. Butter a 13 x 9 pan. Put diced potatoes along the bottom of the pan. 3. Put chicken on top of potatoes. 4. Mix together soup, beans, onion, green chili, red chili and 1 cup water. Add seasonings to taste. Pour over chicken. 5. Cook uncovered for 45 minutes. 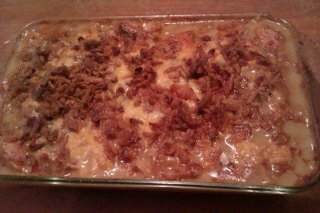 Top with cheese and french fried onions. Cook for an additional 15 minutes. This is what happens in my house when my hubby gets a chocolate craving. I don’t usually like to bake cookies but can’t resist the fun of tinkering with a recipe. I printed out the chocolate chocolate chip cookie recipe from this blog, then I added coconut and almonds. The result was delicious! 2. In a large bowl, beat butter, sugar, eggs and vanilla until light and fluffy. Add flour, cocoa, baking soda, and salt gradually and mix thouroughly. Mix in chocolate chips, coconut and almonds. Drop by rounded teaspoonsful onto ungreased cookie sheet. 3. Cook for 8-10 minutes or until set. Beat together the cream cheese, granulated sugar, and egg until smooth. Stir in the chopped chocolate pieces. Set aside. 4. Divide the batter among the muffin cups. 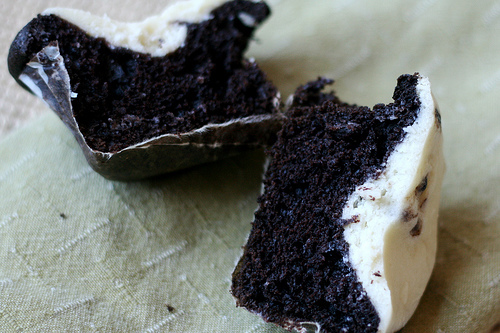 * Spoon a few tablespoons** of the filling into the center of each cupcake, dividing the filling evenly. This will fill the cups almost completely, which is fine. * Whoops! I plum forgot this step. I had even chopped the chocolate and everything. I just forgot to add it. I think I was too excited about the dolloping. * I used a small (1-3/8 inch across), spring-loaded ice cream scoop for this and it came out to three scoops per cupcake. ** I used the same scoop for this step and came out to two scoops per cupcake. Next time I might try a little less—perhaps 1.5 scoops (which would leave some left over, yes)—for a more centered, offset white middle. This main dish summer salad is not only beautiful and delicious, but very good for you. You could substitute just about any fresh summer vegetable for the corn and tomatoes in this salad. Cook barley as directed on package, using chicken broth for the liquid, and drain if necessary. Combine with corn, tomatoes, peppers, chicken, and green onions in large bowl and toss.Combine remaining ingredients in small bowl and whisk to combine. Pour dressing over salad and toss gently. Chill in refrigerator 2 hours before serving. 6 servings.